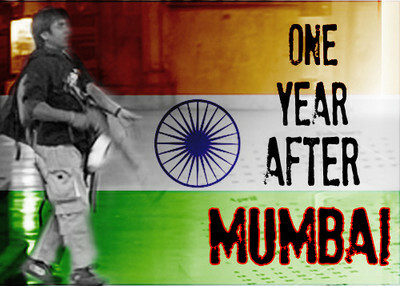 One year after terrorists struck at the heart of India's financial hub, Mumbai is still reeling from the shock of the attacks that left 183 people dead, including nine terrorists, and hundreds more injured. At nightfall on November 26, armed terrorists came ashore in Mumbai, having left the Pakistani port city of Karachi by boat. They attacked several high profile targets throughout the city, including two luxury hotels – the Taj Mahal Palace and the Oberoi-Trident – along with the main railway terminal, a Jewish cultural center, a café frequented by westerners, a movie theater and two hospitals. Six Americans were among the 26 foreigners reported killed. This was not a first for the city of Mumbai. In March 1993, several car bombs were set off at important landmarks across the city, including the stock exchange, killing around 250 people. In July 2006, another series of blasts ripped through Mumbai's commuter train network killing more than 200 people. However, even having "been here before," the attacks that transpired on November 26th were not just more of the same; the 2008 attacks featured stark differences from the past and mark an important step in the evolution of urban terrorism in India. Terrorists for the first time employed frontal assault techniques and sophisticated technology, including global positioning system handsets, satellite phones, and Voice over Internet Protocol (VoIP) phone service to stay in touch with their handlers in Pakistan. Those handlers – watching events in real time on television – orchestrated the attacks from several thousand miles away. Before November 26th, terrorists used bombs triggered by timers to wage jihad on Indian cities, with the notable exception of an attack by five armed men on the Indian Parliament in December 2001. "The Mumbai attacks last November were unprecedented in terms of scale and intensity," Brahma Chellaney, a top strategic expert at a leading think tank in New Delhi, said in an interview with the Investigative Project on Terrorism. "The terrorists were careful to choose those [targets] that would create rage across India." They "took on the rich and the wealthy in India by targeting those two luxury hotels, and by taking on a Jewish center in Mumbai, they took on some foreigners who were present in that Jewish Center in addition to those who were present in the two hotels." "Even a year later now on the anniversary of the Mumbai attacks, India hasn't recovered from those attacks," Chellaney added. The Mumbai terror attacks mark the coming of age of global Islamic jihad. Reports linking the Mumbai attacks to arrests of terror suspects in Chicago and Italy, and evidence that a large part of the planning for the attacks took place in the U.S. and Pakistan, underscore the international nature of the attacks. Two Chicago men – a Canadian and an American citizen both born in Pakistan - for example, are being investigated by the FBI for their possible involvement in the Mumbai attacks. David Coleman Headley and Tahawwur Rana were arrested earlier this month on federal charges for their alleged roles in foreign terror plots that focused on high profile targets in India and Denmark. The FBI claims it has evidence the two men have links to Lashkar-e-Taiba (LeT), the Pakistani terror group believed to be behind the Mumbai attacks. New Delhi has presented evidence to Pakistan that the attackers were trained in and came from Pakistan. Indian government sources have further confirmed that the National Investigative Agency (NIA) has found the Chicago suspects made calls to the same numbers as the LeT handlers in Pakistan who were in touch with the terrorists during the attacks. It has been disclosed that Headley visited India several times in the past three years and stayed at the Taj and Trident – the two hotels attacked on 11/26 – besides meeting with prominent Bollywood stars. Headley reportedly used his contacts with Bollywood stars as a cover for his reconnaissance missions and visited each of the targeted sites, including the Jewish Center, the main railway terminal, and the Leopold Café. Headley and Rana have further been reported to have strong ties to Pakistan, including close links with a former military officer in Pakistan. FBI affidavits also allege that Headley traveled to Pakistan to attend a terrorist training camp and meet with LeT leaders. A Pakistani anti-terrorism court indicted seven suspects this week, including Lashkar-e-Taiba (LeT) operations chief Zakiur Rehman Lakhvi, for alleged involvement in the attacks but the trial has been caught up in red tape and confusion. Earlier this month, India handed Pakistan a seventh dossier of evidence on the Mumbai attacks that included depositions of a Mumbai judge before whom the lone surviving gunman in the attacks, Mohammad Ajmal Kasab, had confessed to being trained in Lashkar camps and claimed LeT operatives, including suspected mastermind Zaki-ur-Rehman Lakhvi, plotted the attacks. The dossier included testimonies of FBI officers who confirmed that cell phones recovered from the terror sites were used by terrorists to communicate with their handlers in Pakistan at the time of the attacks. The FBI had helped India decode conversations recorded between the attackers and their handlers in Pakistan during the attacks. New Delhi has called on Islamabad to take action against Jamaat-ud-Dawah (JuD) leader Hafiz Saeed, founder of LeT, and another alleged mastermind of the attacks. Saeed remains free, however, and recently was reported to be preaching radical sermons at the Jamia al-Qadsia mosque in Lahore. Indian calls to Pakistan to act against the perpetrators of 11/26, including Hafiz Saeed, have been backed by the U.S. Ambassador in New Delhi, Timothy Roemer, who also called LeT a "global threat." Indian calls for extradition of the terror suspects have been rejected by Pakistan. The Pakistani intelligence service – a state within a state? Analysts claim that Pakistan is not likely to dismantle terrorist infrastructure on its soil or to take action against the November 26th attackers. Pakistan's military establishment, including its Inter-Services Intelligence (ISI) agency, has been accused of backing terrorist groups in Kashmir over the past two decades in a bid to wage a low-intensity proxy war against India. "What India faces is state sponsored acts of terror by non-state actors from Pakistan, and behind this state sponsorship is one institution, the Pakistani intelligence called ISI. It is a state within a state. It is not answerable to anybody," Chellaney told the IPT. Saeed, in fact, had the blessings of the ISI when he founded Lashkar-e-Taiba in 1990 to fight Indians in Kashmir. The group was banned by the Pakistani government in 2002 under U.S. pressure but continued to operate under the banner of Jamaat-ud-Dawah, an Islamic charity also founded by Saeed and accused of being a front for Lashkar-e-Taiba. "I don't think the Indians can have much hope that the Pakistanis will actually go after the key guys because in Pakistan we have a split authority, the government in power is run by civilians who're not involved in such acts of terror and they are by and large sincere in what they say. The problem in Pakistan is that the real institution, the one that is most powerful, and the one that is linked up with terrorists is the military establishment and that includes the intelligence organization called the ISI and these guys are not under civilian oversight." The Mumbai attacks can be instructive for the U.S. and other Western democracies, Chellaney said. "What happened in Mumbai in 2008 is a novel method that is likely to be replicated in the West before long." India, he said, has "been used as a lab to try out new techniques of terror. And once those techniques of terror have been perfected in India, they have been replicated elsewhere." For example, the 1988 Pan Am 103 bombing was not unique. In fact, "it was a copy of the similar bombing of the Air India Kanishka jetliner [in 1985], which also was bombed over the mid-Atlantic," Chellaney said. "Similarly, the attacks on city transportation systems, subways for example, on buses, trains, etc. were first tried out in Mumbai in the early 1990s and subsequently they were tried out in Europe and elsewhere." Jihadists, Chellaney concluded, feel that "if they can shake the world's largest democracy, they believe they can shake any Western democracy." India's trial of Mohammad Kasab, the sole surviving gunman in the Mumbai terror attacks, has relevance for the U.S. as it prepares to move 9/11 mastermind Khalid Sheikh Mohammed from a military detention in Guantanamo Bay to a federal trial in New York. "In India, every terrorist goes through a civilian court and therefore for an Indian it's a bit of a surprise that there's a lot of controversy in the U.S. about trying Khalid Sheikh Mohammed in a New York civilian court because that's a normal process in India… [The debate however] does open a question as to whether terrorists who are actually waging war against a country are entitled to the same rights that a citizen of a country has…. For example those who came to attack the United States at 9/11 were seeking to destroy the United States of America. They were seeking to undermine what it stood for, and therefore to grant them the same civil liberties that ordinary American citizens have does raise an interesting question and I think that we need to debate that question fully. But we need to have a more international standard on this because I don't think it really helps to have one standard in the U.S., another standard in Britain, a third standard in India." "We should not black out coverage, but we should do it in a way that the media is not helping the terrorists because the terrorists in Mumbai were in link by telephone with their handlers in Pakistan who were watching live television and could actually warn these attackers in Mumbai of what was coming." The initial response was "pretty amateurish," according to Chellaney. Indian police were ill trained to deal with the attacks and commandos had to be flown in from New Delhi, which took several hours. But he sees progress: "Investigations since those attacks have been more professional ... crisis management procedures are better now so if there were to be another attack, the Indians would be more prepared to respond in a more professional manner." Challeney is an expert in this segemnt. and as usual there is not much to comment on his views except totally agreeing with him. Now that Headly & Rana have been arrested there will be more & sustained pressure on Pak government from USA to act , and hopefully action will be initiated against Saeed also. This apart, what is more important is people to people contact, which came to a stand still with 26/11, should be restored specially in the cultural and sports field.It was encouraging to hear from MEA that Visa will not be a problem for Pak players for IPL3. Artists from Pak like Ghulam Ali, Late Nusrat Fteh Ali Khan Saheb, Rahat Fateh Ali Khan are very popular names in India. People in India are longing to have the artists back in India. Government of India while maintaining sustained pressure on Pak for action on terrorist, should at the same open the doors for cultural exchange between the two countries.The bond between the pople of the two countries has remained strong despite the differences between the governments.It is the poeple again who can change the atmosphere from animosity to affinity between the two countries. This will also help promote peace and harmony between the two countries and leave the terrorist with no support base. This will help reduce terrorism if not totally overcoming it.